PROUD BRITISH rockers, The Treatment, have confirmed the digital release of their five-track covers EP, ‘Then & Again’. Originally limited to 300 signed physical copies and recorded in celebration of Record Store Day on April 21st 2012, ‘Then & Again’ was produced by Airrace guitarist/songwriter Laurie Mansworth, who also produced the band’s debut album, This Might Hurt, released through Spinefarm in September 2011. You can now get your copy through iTunes. 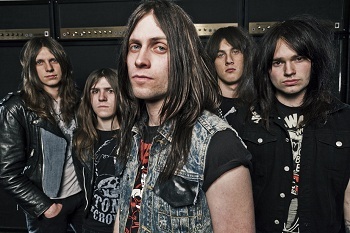 The Treatment are currently guesting with Kiss & Motley Crue on the hottest US rock tour of 2012. Called simply ‘The Tour’, this run of 40-plus US / Canadian dates features rock legends Kiss & Motley Crue going head to head live for the first time since 1982; The Treatment, favourites of Crue bassist Nikki Sixx, were invited to join this run of arena dates after Sixx came across their debut ‘Drink, F**k, Fight’ single / video. Two weeks into ‘The Tour’, and the reaction of fans and media alike has been outstanding, with ‘This Might Hurt’ entering the US New Artist Billboard Charts and headline dates being added along the way; in addition, the band have been interviewed by Fox TV and, in recognition of how well they are doing, a special ‘meet & greet’ has been organised at the newly opened Kiss Monster Mini Golf attraction in Las Vegas. Following the US run, The Treatment will release a new single / video from This Might Hurt , titled ‘Shake The Mountain’; the digital single will be available from November 26th, heralding a further run of UK dates with Thin Lizzy.